First Line: I was pleased as Punch on that glorious spring morning when Lady Hardcastle finally said, "Come on then, Flo, what about a nice Wednesday walk?" 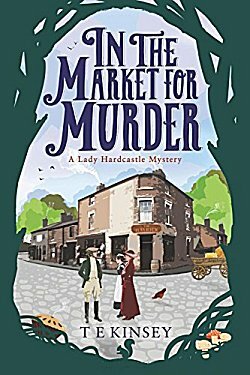 Lady Hardcastle has been resting and recuperating, but it's spring in the year 1909, and it's time for this eccentric amateur sleuth to start getting back in harness. What better way than to join her maid, Florence, and a neighbor on a trip to the cattle market? Call it local color and meeting more of the neighbors. When a farmer winds up face down in his serving of the pub's beef and mushroom pie, there are only two people the locals want on the case. That's right-- Lady Hardcastle and her maid. Once the two begin investigating, they find all sorts of puzzling clues and suspects. Finding the right solution is going to be tough indeed. Occasionally my rational brain reminds me that the men in 1909 would not be willing to leave such investigations to mere females, then I remember that these books are meant to be fun. Thankfully there's not much in the book to be picked apart. How two characters can be so avant-garde yet the book give such a true sense of the times, I don't know, but I'm enjoying this series to bits! It's fun to smile the entire time I'm reading a book. I like amateur sleuths very much so this is very much my cup of tea. Thanks for the review. You're welcome. I really enjoy these books!